For some reason, unless a staircase is a central focus in an entrance, like a long spiral one that stretches two stories high, they are always poorly lit. There may be a light at the top of the landing and/or one at the bottom of the stairs, but those lights aren't that helpful in seeing the separation between steps, especially if the steps are carpeted. First Street carries a pretty neat set of Stair Lights that come in a kit with a light for each step and they are pretty high tech! The Stair Lights Kit comes with a track system, complete with the tools you need to set up the lights, and four stair lights. 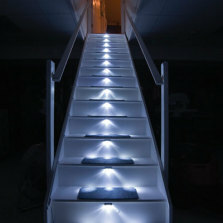 No, that's not too many stair lights, but you can order as many as you need separately. The track system operates by switch or by a sensor which can turn your stair lights on and off automatically. The sensor is controlled by ambient light, so if you turn on a light in the vicinity of the stairs, the stair lights will automatically go on. The tracker also has a 12-hour battery backup in case there is a power outage in your home. 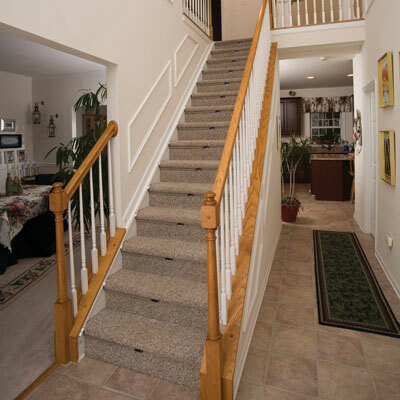 Each stair light is a 3-beam LED spotlight that attaches to your steps; there are different kits for carpeted vs. wooden steps. All wiring is concealed in the track system. Oh, the Stair Lights Kit is for straight staircases only. Available at FirstStreet. EDITOR'S NOTE: This item is no longer carried by FirstStreet.com. 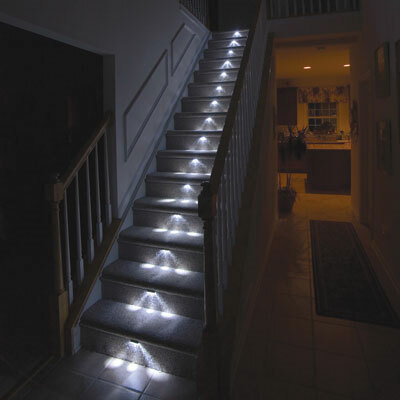 These stair lights from Amazon have excellent reviews and may be a good alternative.